Garden shade can be both a joy and a challenge. 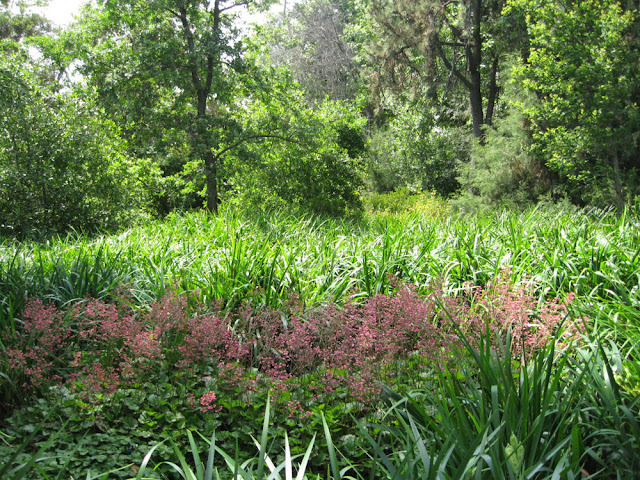 Fortunately, Californians are blessed with plenty of charming native perennials that are shade-lovers. Among the shady favorites are the Heucheras (Alumroots or Coral bells). 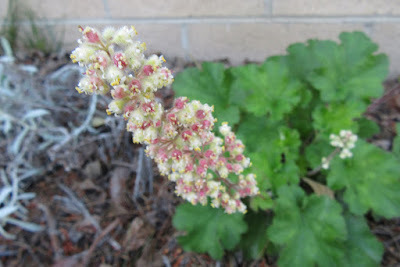 A good example, the Seaside alumroot, is blooming right now in Mother Nature’s Backyard. The genus name, given by none other than Linnaeus, honors Johann Heinrich von Heucher, professor of Medicine and Botany at Wittenberg University. The scientific name is pronounced several ways: HOY-ker-uh, HEW-ker-uh, or HER-ker-uh. The first pronunciation is probably closest to the original, but all are acceptable. The species name is pie-low-SISS-ih-muh. The Heucheras are delicate-appearing perennials that are hardier than they appear. All species in the genus are native to N. America, with thirteen native to California. 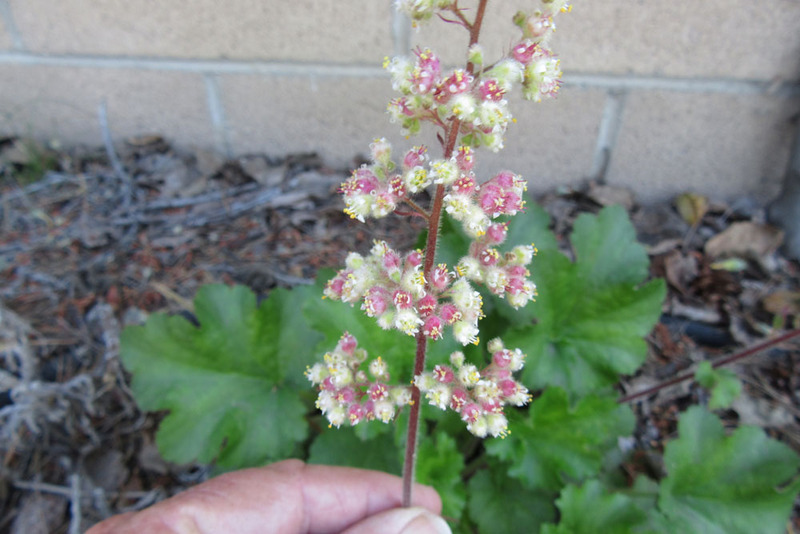 Some California Heucheras grow along the coast, while others are endemic to the mountains – often with limited geographic ranges. 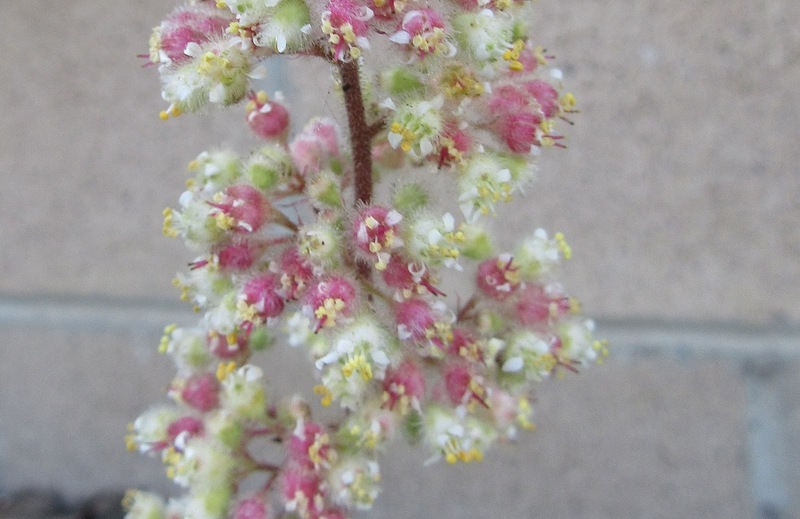 Only three are native to Los Angeles County: Heuchera abramsii, H. caespitosa and H. rubescens (all mountain species). Fortunately, species from other California regions adapt well to local gardens. 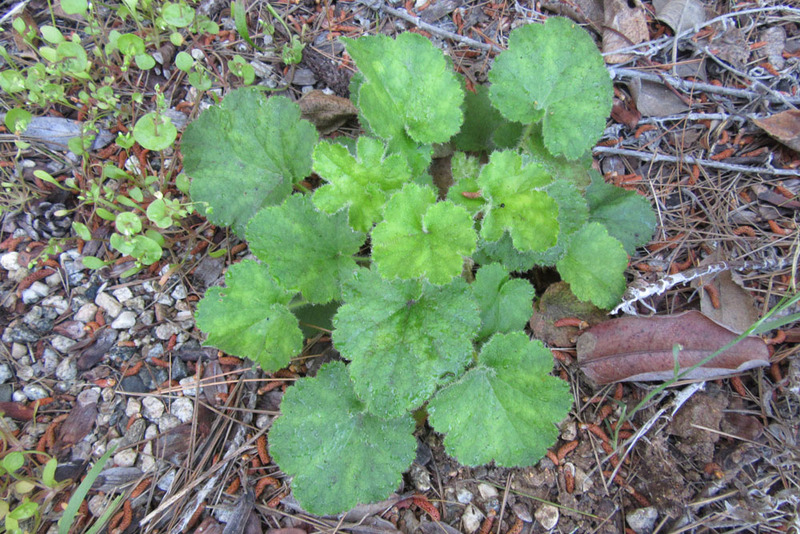 Heuchera pilosissima is native to the coastal forests of Central and Northern California (below 1000 ft. elevation). Gardeners around the world are familiar with Heucheras. They’ve been grown in gardens for many years, and numerous named cultivars are readily available. Many cultivars derived from Heuchera americana (native to Central and Eastern N. America) have brightly colored leaves, making them prized accent plants in shade gardens. The California natives all have green leaves, though some of the mountain species are very petite in size. Our natives have flower colors which range from white or cream to medium pink. The darker pink and red flowers are found on species from the American Southwest and Baja California. The Southwestern species are sometimes crossed with California natives to produce showy hybrid cultivars. 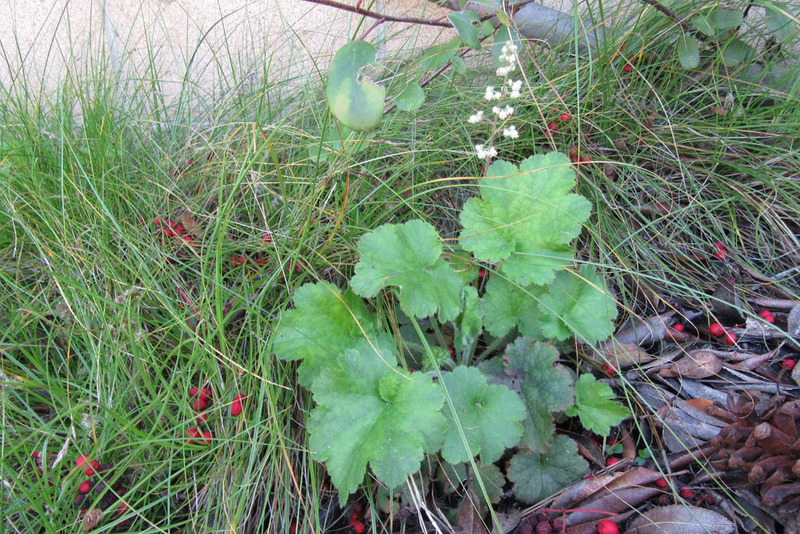 Seaside alumroot is medium-size for California species, growing 1-2 ft. (to 0.6 m.) tall and wide. 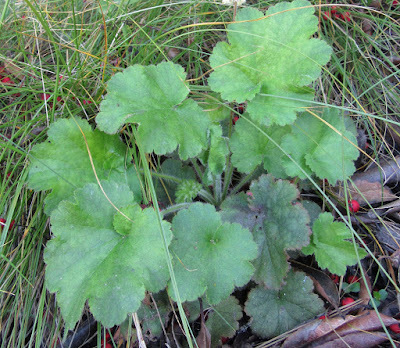 Plants form an evergreen mound about 1 ft. tall & wide – typical of the Heucheras. The leaves have a long petiole and are somewhat succulent. Their shape is rounded and looks a bit like a grape leaf. The leaf color is bright to medium green; on our plants, the color is slightly mottled. This species is hairier than some native Heucheras, with the entire plant covered in shaggy white hairs. In fact, the name pilosissima means ‘hairiest’. Like all Heucheras, Seaside alumroot produces small, bell-shaped flowers along vertical flowering stalks. The entire flowering stalk and flowers are covered with glandular hairs and the flowers are densely clustered about the stalk (more so than in many species). The many flowers, and their unusual pastel colors, make this a prize Huechera in our estimation. The flowers are small (0.25 inch or less) and pink or white colored (ours have a mostly pink floral cup (hypanthium) with white tips to the petals - see photo below). The sexual parts are exserted (protrude out from the neck of the floral cup). Heucheras are primarily pollinated by bees. In our garden, they are visited regularly by hummingbirds, which may also serve as pollinators. In general, Heucheras are not self-fertile, so you’ll need several plants if you want seeds. We raised our Seaside alumroot from seed. It wasn’t difficult, the only challenge being to keep seedlings moist in our dry climate. We hope our plants will self-seed and fill in shady areas in our garden. Heucheras also reproduce vegetatively, producing offsets (new little plants). If plants become too large for their space (or about every three years) they can be divided. For details on dividing Heucheras see ref. 3, below. In S. California, the Alumroots do best in shade – afternoon shade to bright shade under trees for best foliage and flowers. 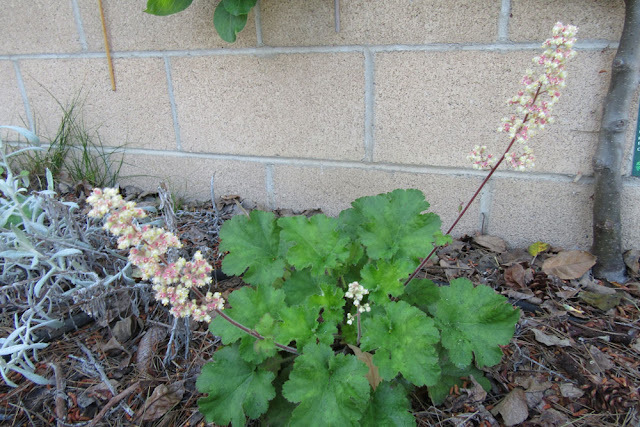 Seaside alumroot does great on the north side of a wall or building. It tolerates sandy soils and likes a well-drained soil. That being said, this species is doing well in our clay loam. The quoted pH is slightly acidic (pH 5.0-7.0), although ours is a bit more alkali. Hailing from the northern coast, Heuchera pilosissima is adapted to more yearly precipitation than it gets in S. California. We water our plants on the same schedule as our apple tree – a good soak every 2-3 weeks from May through mid-September. It could probably take weekly water in sandy soils. The only precaution is to not overwater in hot, humid conditions (which promote soil fungi and root rot). Southern California gardens are generally so dry and breezy that this is seldom a problem here. Heucheras are mostly disease-free and easy to manage. Remove old leaves as needed. Cut back flowering stalks after collecting seeds. And divide older plants as needed. Plants grown in containers need a dose or two of half-strength fertilizer in late-winter or early spring (when plants begin to grow). That’s really about all. in garden with Carex pansa, Ribes viburnifolium. We love the look of Heucheras as a ground cover in shady places. Their small size and neat appearance make them good candidates for lining shady walkways – or growing in containers. We like to plant them near seating (we love to have hummingbirds come within arms-length). 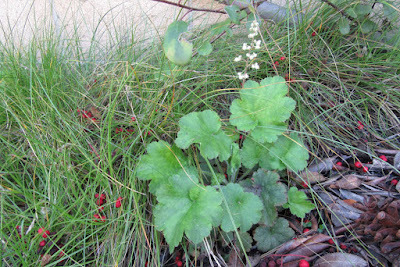 And Seaside alumroot gives a woodsy look to any shady garden spot. If you can’t find this species (plant or seed), consider the hybrid cultivar ‘Lillian’s Pink’ (a garden hybrid between Heuchera pilosissima and H. sanguinea). It’s readily available and has the nice foliage characteristics of Seaside alumroot with the darker pink flowers of the Coralbells (H. sanguinea). Any way you choose – straight species or cultivar – California’s Heucheras are guaranteed to please! 'Lillian's Pink' alumroot (Heuchera pilosissima X H. sanguinea): Rancho Santa Ana Botanic Garden, Claremont CA. Would you be a able to contrast the pilosissima with the two species we most often see in the trade: maxima and macrantha? 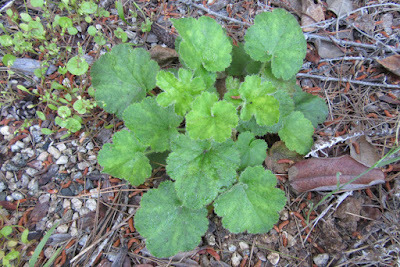 The Seaside Alumroot has foliage that is hairier - and more refined-looking - than either of the other two. The leaves are also smaller, though not as small as some of the S. CA mountain 'miniatures' like H. abramsii. The flowers of the Seaside species are pale, two-tone pink (usually). The flowering stalks are shorter than the other two species, and the flowers are more densely clustered around the stalk. This species really does look different from the other two; would make a nice contrast with either. And you might get some interesting 'garden hybrids' if you planted them together.